So despite the false start of yesterday, today brings fantastic news - the splint is no more, I am a free man again, free to talk in a relatively normal (OK, the bands do somewhat restrict talking) manner and engage in conversations without having strangers wonder what accident befell me to cause such slowness and incomprehensible English! I visited my Orthodontist this morning so that he could add a wire to the top of mouth. The reason? Now that I no longer have the splint to ensure that my upper jaw doesn't revert back to its previous position (see here for an explanation of what this means) the wire that they attached today will take the role of the splint. It takes 2-3 months for the bones to fuse strong enough that the bones themselves can counter any pressure that the jaw muscles place on the jaw so in about a month or so I will have the wire removed completely. 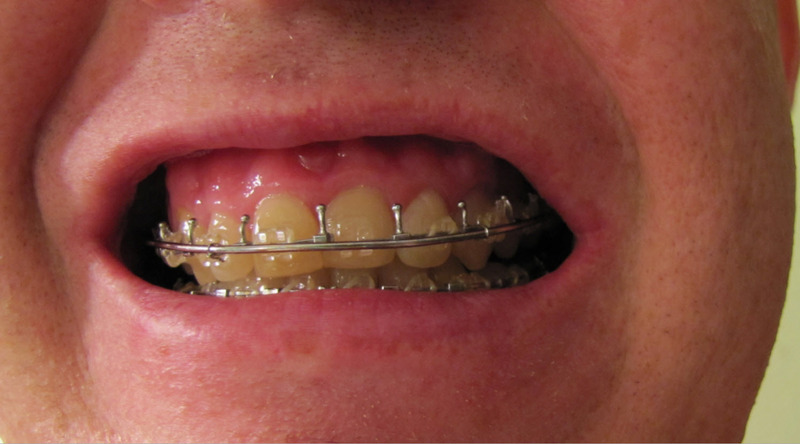 My Orthodontist wanted to remove my entire top brace wire and replace it with this new, thicker wire (thicker so that it is strong enough to keep my jaw in place) but unfortunately my jaw is not presently able to open wide enough to allow him the space to do everything that he needed. Instead, he decided to simply add this new wire on top of my existing wire. You can see the wire in the rather scary picture on the right . . . Most of you will remember the time that you had your braces first put on your teeth and how much they ached for the first few days / weeks, right? Well, my teeth today have felt like that first day; aching along with my jaw joints. I have another appointment tomorrow with my oral surgeon so he can check on the wire, make adjustments to the bands, etc. Three visits this week to various doctors! I don't care though as I got rid of the splint, YAY!!!!!! As for what foods were eaten today, I have listed them below. Each time I describe what I have eaten, I think, wow, you eat the same foods each day! :) Well, I really do to be honest and it is mainly because the foods are super soft in my mouth, they don't hurt my jaw joints when I eat them, they are quick and easy to make, and most of all, I love eating them!